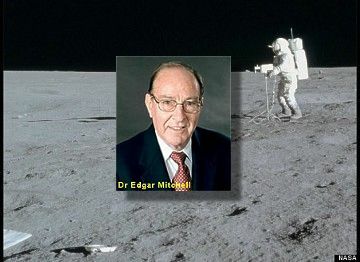 On Feb. 5, 1971, Edgar Mitchell became the sixth of only 12 men to step on the moon. Of that elite dozen, which included Buzz Aldrin and the late Neil Armstrong 44 years ago this week, Mitchell is the only one to go on record about his controversial belief in extraterrestrial UFOs -- and of a possible government cover-up. Mitchell, 82, is no dummy. While on active duty as a test pilot for the U.S. Navy, he completed an M.S. in aeronautical engineering at the U.S. Naval Postgraduate School and a doctorate in aeronautics at the Massachusetts Institute of Technology. Mitchell also served in combat during the Korean War as a fighter pilot. In 1970, he was awarded the Presidential Medal of Freedom. After retiring from NASA in 1972, he founded the Institute of Noetic Sciences and later wrote “The Way of the Explorer” to document his experiences with mysticism and space. I recently spoke on the telephone with the retired U.S. Navy Captain from his home in West Palm Beach, Florida. He was lucid and convincing with his heavy southern drawl, and just a little guarded. . . . Clash: You’re also known for your views on UFOs. What’s your experience regarding the Roswell, New Mexico, incident of 1947? Mitchell: After my space flight, I was contacted by descendants of the original Roswell observers, including the person who delivered the child-sized coffins to the Air Force to contain alien bodies. Another was one of the children of the deputy sheriff who was patrolling traffic around the site. . . . Here we go again with Mitchell! The man is plainly off his rocker when it comes to UFOs and ETs. He is not speaking from experience and only repeats what he has been told. He is so gullible that he promotes the b.s. surrounding Roswell. Mitchell is a simple man and if I ever meet him I'll offer him the Brooklyn Bridge and he'll jump on the chance to own it. Anyone who pays attention to his verbal diarrhea deserves to be also criticized. Mitchell should stick to talking about what he is experienced in and that's space travel and restricted to his astronaut experiences 'cause that's where he is on solid ground. Otherwise he is treadingn on quicksand and sinks a little anytime he speaks about fantasies.